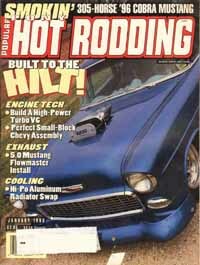 This Issue Includes: Arfon's Last Bonneville Run; How To Get Started In Drag Racing; Preview - Big Winter Drag Meets; Performance Test - Shelby Mustang GT350; Directory Of Flywheels And Clutches; Drag Test: Project 'X' 57 Chevy; Tips On Building A 427 Chevy Engine; How To Re-wire Your Car; Cars: 33 Willys 5W Coupe Gasser; 50 Austin A40 Pickup Gasser; 27 Ford Model T Bucket Roadster Pickup; 34 Ford 5W Coupe Gasser; 48 Anglia 2dr Sedan Gasser. 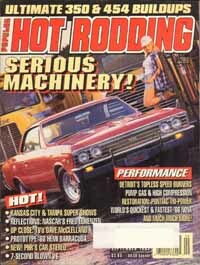 This Issue Includes: River Racing With Cars? 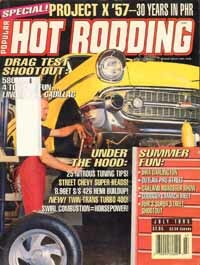 ; Glitter And Go From The Northwest; Indy's Over - Was It A Disappointment? 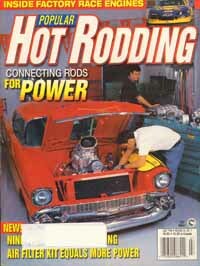 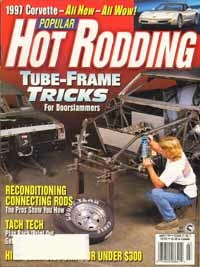 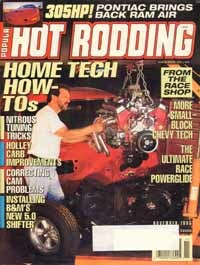 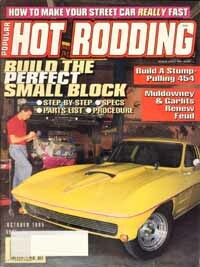 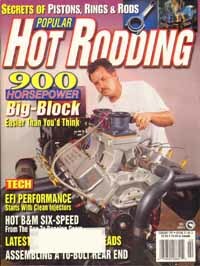 ; Super Tune Your Suspension Like The Pro's Do; How To Build Super Performance Heads For The 440 Engine; A Big Olds For The Chevy; How To Mount A Fun Bug Body; Product Test: Rhoads Variable Lash Lifters; 289 Ford Quick Reference Guide; Tri-Power Performance Goodies; Cars: 33 Willys Panel Delivery. 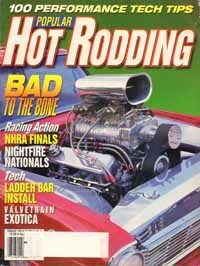 This Issue Includes: Bluegrass Street Machines Louisville, Ky.; 7th Annual Pop Rod Championships Martin Mich; NHRA Gatornationals Gainesville, Fl. 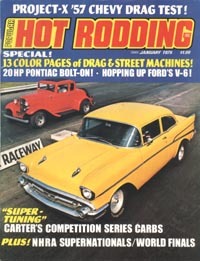 ; Street Rod Drag Race Irwindale, Ca. 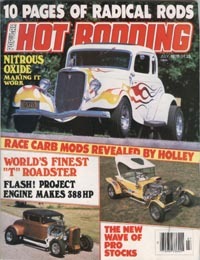 ; How To Build A Street Rod Project 34 Ford 5W Coupe; 800 CFM Holley 2-Barrel! 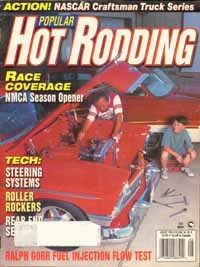 ; How To Set Up A Chevy Super Stocker 67 ChevyII Nova Coupe; Project Street Machine Returns 33 Ford Pickup; Clutchless 4-Speed Kit; Mopar Bracket Racing Tips; Cars: 33 Ford 3W Coupe; 33 Plymouth 5W Coupe; Don Prudhomme 75 Chevy Monza Funny Car; 32 Ford ForDor Sedan; 23 Ford Model T Roadster Pickup; 15 Ford Model T Bucket Roadster Pickup; 48 Anglia 2dr Sedan. 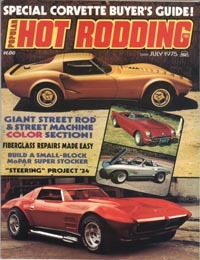 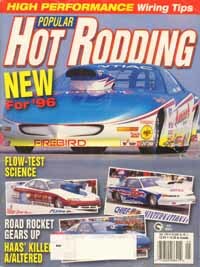 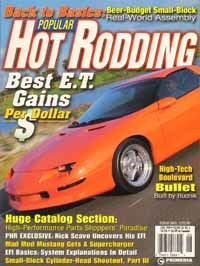 This Issue Includes: Special Corvette Buyers Guide; 7th Annual Pop Rod Championships Martin Mich; Kansas City Mo. 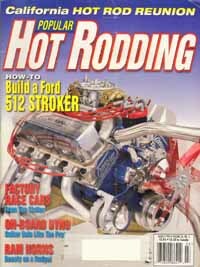 15th Annual World Of Wheels Show; Fiberglas Repairs Made Easy; Build A Small Block-Mopar Super Stocker; Project 34 Ford 5W Coupe 'Steering'; More Oats For The Olds 455; Cars: 34 Ford 3W Coupe; 54 Corvette Roadster; 67 Corvette Roadster Hardtop Street Machine; 29 Ford Model A Roadster Pickup; 56 Chevy 2dr Hardtop; 32 Ford Chopped 5W Coupe; 34 Ford Sedan Delivery; 64 Corvette Coupe Street Machine; 66 Corvette Chopped Roadster Hardtop Custom; 26 Ford Model T Pickup; 32 Chevy 2dr Sedan. 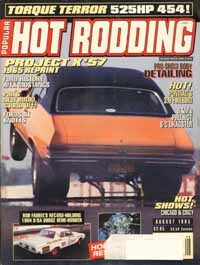 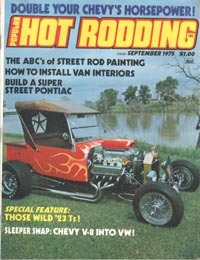 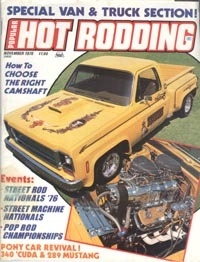 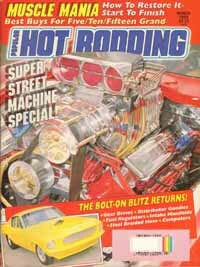 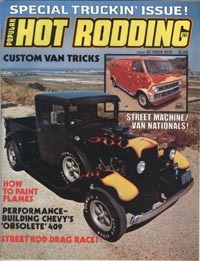 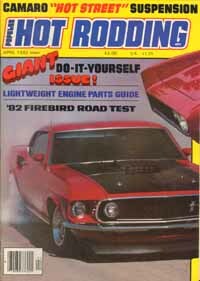 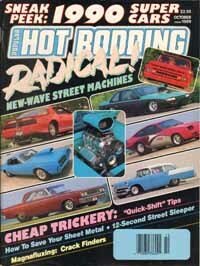 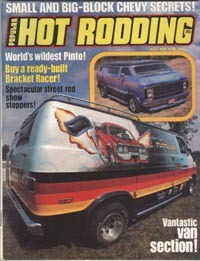 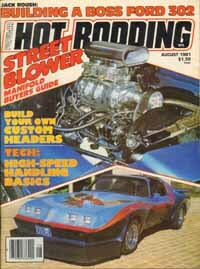 This Issue Includes: Street Rod Drag Race Irwindale Raceway; Street Machine/Van Nationals Des Moines, Iowa; Performance-Building Chevy's 'Obsolete' 409; Pop Rod's SuperVan 68 Ford Econoline 200 Van Gets Paint; How To Paint Flames Project 33 Ford Pickup; Street Carb! 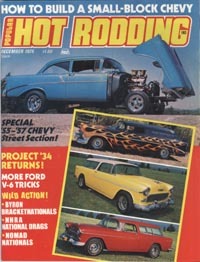 Carter AFB; Custom Van Trends; Build A Super Street Olds 455; Do-It-Yourself Van Murals; Cars: 55 Chevy Lifted 2dr Sedan; 52 Ford Pickup; 36 Chevy Pickup; 55 Chevy El Camino Pickup; 41 Willys Pickup; 72 Dodge A-100 Tradesman Van Custom; 34 Ford Sedan Delivery; 41 Willys Coupe; 24 Ford Model T Bucket Roadster Pickup. 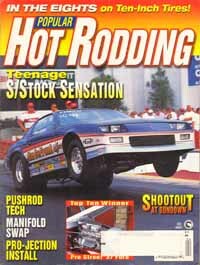 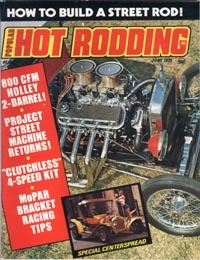 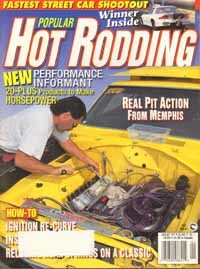 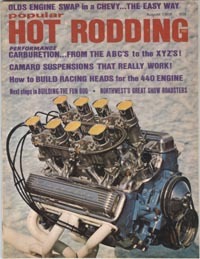 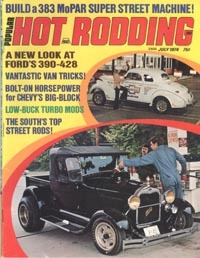 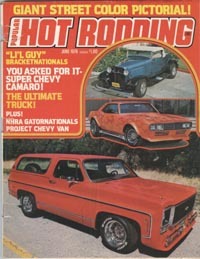 This Issue Includes: NHRA National Drags Indy Shootout; 8th Annual Pop Rod Championships Martin Mich; Nomad Nationals Memphis Tenn; The Bracket Nationals Byron Ill; How To Build A Small-Block Chevy; Project 34 Ford 5W Coupe Returns; More Ford V-6 Hop-Up Tricks; Cars: 32 Chevy 5 Window Coupe; 34 Ford Sedan Delivery; 55 Chevy Nomad 2dr Wagon; 71 Corvette Coupe Custom; 56 Chevy Lifted Nomad 2dr Wagon; 75 Chevy Monza ProStock; 30 Ford Model A Roadster; 56 Chevy Lifted 2dr Sedan; 57 Chevy Nomad 2dr Wagon. 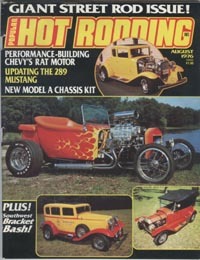 Condition: Has Two Pages With Special Offer Coupons Cut Out. 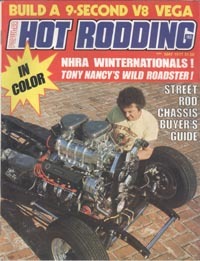 This Issue Includes: Gettin' Down In Louisville; '76 NHRA Gatornationals; "Li'L Guy" Bracket Nationals; Announcing The 2nd Annual Street Rod Drags; Announcing The 8th Annual Pop Rod Championships; Super Chevy Camaro Project; Project Street Roadster - Part IV; Balance Of Power; Project Chevy Van - Part III; Programming The Valve Body; Cars: 27 Ford Model T Coupe; 32 Ford Roadster; 76 Chevy Chopped Blazer; "Beachcomber" Funny Car; 57 Hillman Husky Sedan Delivery; 34 Ford Hiboy Roadster; 28 Dodge 4dr Sedan; 71 Pinto Coupe. 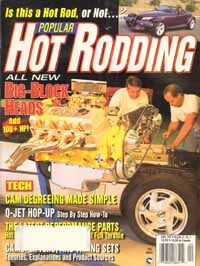 This Issue Includes: Announcing The 9th Annual Pop Rod Championships; Street Rod Nationals South; It's A Street Rod Drag Race! 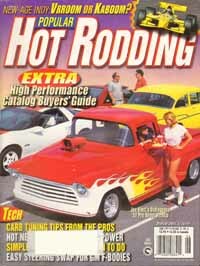 ; Antique Nationals; PHR Photo Spectacular; Dallas Car Show; Just Another 355-Inch Chevy? 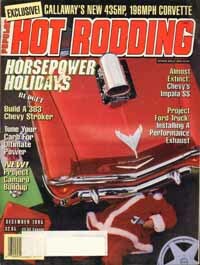 ; Custom Aluminum Fuel Tanks For The Street; The Super Duty Rod Is Back! 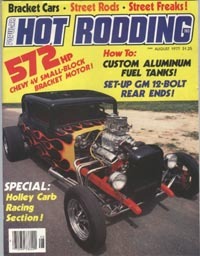 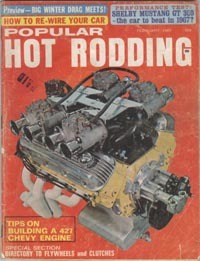 ; Setting Up The GM 12-Bolt The Right Way; Edelbrock And The Calibrated Conversion; Cars: 32 Chevy Loboy Chopped Coupe; 69 Chevy Camaro Coupe; 27 Ford Model T Comp Roadster; 33 Willys 5W Coupe Gasser; Jerry Ruth Rear Engine Rail Top Fuel Dragster; 23 Ford Model T Comp Roadster; 28 Ford Model A Roadster; 34 Ford Tudor Sedan; 48 Fiat Topolino Hiboy Coupe; 20 Model T Ford Hiboy Flatbed Pickup; 75 AMC Pacer Pickup Custom.